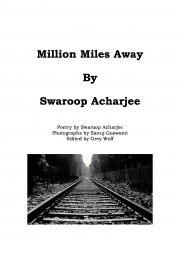 Description of "Million Miles Away (eBook)"
Swaroop Acharjee is an Indian poet/Author from India in the state of Kolkata in West Bengal. Full-time he is a student of Information Technology at the RCC Institute of Information Technology. Reviews of "Million Miles Away (eBook)"
Superb book, well executed and most recommended. Beautifully written and well thought out. A absolute must for poetry lovers everywhere. A very talented writer who will exceed in his field of literature.